One Eternal Day: "When the son of man shall come in his glory..."
While living in Florida some years back, due to limited choices I was attending a church of a different denomination than my own. It was a large, growing, dynamic congregation. The pastor announced a series of sermons on Revelation. But when he started preaching, it quickly became clear he was not teaching the Dispensational Premillenial (i.e., Left Behind) interpretation that's so popular in our day. He was an amillennialist. Many congregation members were not happy about this, and made their opinion known. After a few weeks of controversy, the pastor got into the pulpit one Sunday morning and announced that, for the sake of peace, he was discontinuing the sermon series on the End Times. Instead, he would take up a topic that would trouble people less. “I'm going to preach on Hell,” he said. 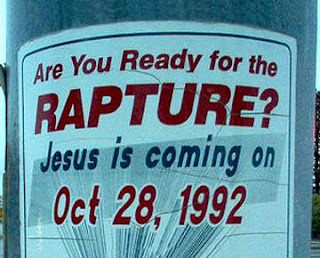 Growing up in a Lutheran pietist church (yes, there are such creatures; I had no idea how rare we were at the time), I was introduced early to Dispensational Premillennialism, and had no idea there was any other way to approach eschatology.